“My name is Doug, and I spent most of my childhood and early adult life with teeth and a smile that I was not very proud of. My teeth were very crooked due to overcrowding. I was missing a front tooth and another was chipped due to a childhood fall. Consequently, whenever I was forced to smile, it was always with a closed mouth. I consulted with numerous dental professionals and just about all of them said that I would have to have my jaw broken, rewired, and then begin orthodontic treatment. “I received a recommendation to speak with Dr. Frial about procedures to gain a smile that I could be proud of someday. He was the only one who said that he was confident he would be able to correct my smile problems without such radical measures. He said that it might take some time but he had the technology and ‘know-how’ to make it happen. I was given excellent referrals to other dental professionals for the extensive care that I needed to make sure my smile would last. “Dr. Frial and staff have proven themselves to be one of the best-run dental offices I have ever patronized. The first impression of an office starts with the front office staff, and Dr. Frial’s staff is nothing less than professional and friendly. The office really caters to the needs and concerns of the patient. The kids enjoy checking in by clicking their pictures via their computer up front. Everything is explained to a ‘T,’ not only to the parents but to the kids as well. The kids are made comfortable in the waiting room by the use of Game Boys and books. Dr. Frial even has a rewards system where the kids are given tickets if they wear their Dr. Frial T-shirt at their office visits. Tickets are then put in a raffle for a prize. Dr. Frial plans a patient appreciation ice skating party every summer, to the delight of the kids. 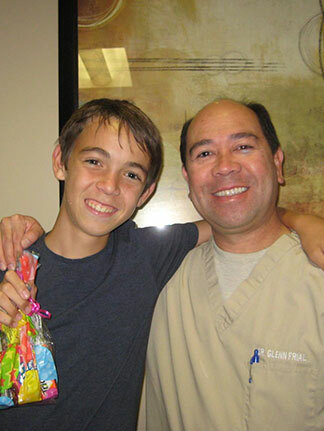 “My children have had a wonderful orthodontic experience with Dr. Frial and his staff. I have seven children, with five having been patients of Dr. Frial. My last two will probably also need orthodontic treatment. “The office staff has always been helpful and friendly when scheduling and rescheduling appointments. There is almost no waiting time at all. They are on time with all the appointments I have had over the eight years we have been patients. “The orthodontic staff has made it easy for my children. They are gentle and kind. They help explain the process to the children as they work on them. One of my daughters had a fear of dentists and dental work, but Dr. Frial and his staff were prepared for her. They were sensitive to her fears and concerns. They were very gentle with her and, as a result, she had a great orthodontic experience. “Alison Goldstein has been awesome at explaining the orthodontic process and helping us choose from the various financial options. She is quite good with the children when explaining the process of expanding the jaw, wearing braces, and caring for the retainer. “Dr. Frial has done a marvelous job in straightening my children’s teeth. The proposed treatment plan and actual treatment ending times were on schedule. He was wonderful with all my children! He took the time to explain the process and patiently answer all my questions. “Over the years, Dr. Frial has had a Patient Appreciation summer ice skating party. This has been quite a hit with my children. They look forward to ice skating every summer. Eating pizza and drinking soda and hot chocolate are the highlights of the evening. The raffle and door prizes make the evening a fun surprise!